I've reviewed and listened to a lot of V▲LH▲LL's material, being sucked into an abnormal aura of witchhouse music. I thought it was high time that I interviewed the peculiar folks behind the act, who, even after talking them through this interview, refuse to come out with their identities. Let's start off this interview the bland and boring way. Tell us all a little about V▲LH▲LL. V▲LH▲LL - "Sure! We started out in 2012. We had both been doing music in other projects before but we felt early on that we had something special going on with this one. We mixed styles and experimented a lot and found our sound quite easily. We were influenced by a lot of witchhouse, neofolk and different electronic genres." One thing that seems to be pretty under the curtains would be the actual members of V▲LH▲LL. I noticed that there's usually a female and a male singer; would you be able to tell us of the people behind the mysterious V▲LH▲LL? V▲LH▲LL - "You are correct in that we are a male/female duo. We decided to keep our identities a secret and let the music be in focus. Who we are and what we did before should not affect the way people listen to our music as V▲LH▲LL. In a way it helps the stories in the songs as well. We can wear any mask and get into any character and it will still all be real...or unreal." I've always found the Witch House genre to be fascinating and mysterious. Tell me, how exactly did you find out about the genre? V▲LH▲LL - "We agree. There are a lot of amazing acts associated with that label. We'd rather call it a label than a genre as the sounds within it differs so much. We got into it through a friend. He introduced us to some bands and websites and we started exploring it from there (and are still exploring it all the time). It was the first time in years that new music actually surprised us and got us excited to dig deeper. And it still does." What made you sit down and decide that Witch House was going to be the route you were going to take with your music? V▲LH▲LL - "It came naturally. The sound we wanted to make all of a sudden had a suitable label and a whole lot of genuinely interested listeners. During our first year as a band we got way more attention than we'd thought we'd ever get. It was really amazing." One question that I have got to ask is why are there so many symbols replacing letters in both your name and titles of songs and albums? V▲LH▲LL - "Well we get that question sometimes and there are a few answers to it. A lot of witchhouse acts do it and it is a way to associate with that label. We also like the aesthetics. It works well with the mystique of the music. The two triangles in our band name represent two mountains and is a symbol for duality. Light/Darkness, Male/Female, Good/Evil, the Realms of men and the Land of the gods." Now, let's dig into your discography a bit. I understand that you do a lot of collaborations with other artists. I noted you had a mix on Distorted Memory's Temple of the Black Star, had a single with Ronobe, and have also done split releases alongside Mircalla and Zeeks. Why do you do so many joint efforts? 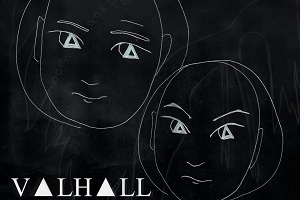 V▲LH▲LL - "It is one of the things that we love about the witchhouse label. People are very open to collaborations and exchanging remixes and generally cool guys. You learn a lot from working with other people and with other artist?s material. We think collaborations are a great way to explore new paths musically and it's also a way to get your music out to a wider audience and of course getting people to notice artists that we ourselves enjoy." Ravens and Ghosts seems to be your first official full length release. And, I have to say, it's pretty impressive. How do you actually get the ideas for your albums? V▲LH▲LL - "Thank you! Ravens and Ghosts is a compilation album featuring of our halves of the two split releases we've done with Mircalla (Ghosts of Antiquity and Malleus Maleficarum). We wanted to make a self-released CD to bring with us on our gigs during the summer of 2013. It was also a way to tie together our work so far. Our next big step will be our official full length debut album on Artoffact later this year." V▲LH▲LL - "Yes. It has. Everyone can't love everything but the overall reactions have been very positive. We have gotten some great reviews of our releases and been on best-of-the-year type lists both 2012 and 2013. We have also had great response to our live shows at Kuudes Aisti festival in Helsinki and Summer Darkness in Utrecht. We have two gigs planned for this year so far. Helsinki (again) and Prague. Follow us on Facebook for updates." As of right now, there's really only been one official CD release by you. Do you have plans to release more CDs as the time goes by? Or even some special vinyl or cassette editions? V▲LH▲LL - "The Ravens and Ghosts CD is the only pure V▲LH▲LL physical release right now, but there is also the Malleus Maleficarum split CD available from Phantasma Disques. It is probably sold out though. We have some copies stuck away as well that we will bring to our shows during 2014. As we mentioned earlier we are now signed to Artoffact and our debut album is coming later this year. We can't really tell you anything yet in what form that will come. It's too early still. We do however ourselves love collector items and both vinyl and cassette releases is more than possible at some point. We've also been talking about doing a VHS release of music videos. We'll see what the future holds." And, at this time, the interview is over. Do you have any final words? V▲LH▲LL - "We do - Thank you! We are glad that you wanted to know more about our band. We are grateful for the opportunity to share our views on things and hopefully some people reading this will take a few minutes of their time to check out our music as well." Spanish Techno Rockers Hollow Earth releases video for the track "Hell"
Who we are and what we did before should not affect the way people listen to our music as V▲LH▲LL. In a way it helps the stories in the songs as well. We can wear any mask and get into any character and it will still all be real...or unreal.